The horse is a friendly animal. It is beneficial for us. Like elephants and camels, it carries loads. It’s riding is very enjoyable. We have written some short and simple essays for class 1, 2, 3, 4, 5, 6, 7 and 8. You can select any according to your requirement. 1.The Horse is a smart and beautiful animal. 2. It is white, red or black in colour. 3. It is tall, alert and majestic. 4. It is very faithful and obedient to its master. 5. It runs at high speed. 6. It has a bushy tail and a strong body. 7. They eat grass, grain and live in a stable. 8. People train them to carry passengers. 9. They carry goods, letters, from place to place. 10. They were used on the battlefield in the past. The horse is a noble and helpful animal. It has no horns on its head. It has four legs and two small ears. It has a strong and stout body. It is very beautiful to look at. It has flowing hair on its neck. It is called mane. It has a bushy tail. It is of different kinds and colours. They are red, black, white and spotted horses. There are big and small animals. The small horses are called ponies. Children ride on them. There are many stories about it. Chetak was the horse of king Rana Pratap. It saved him from dangers. It is a very intelligent animal. 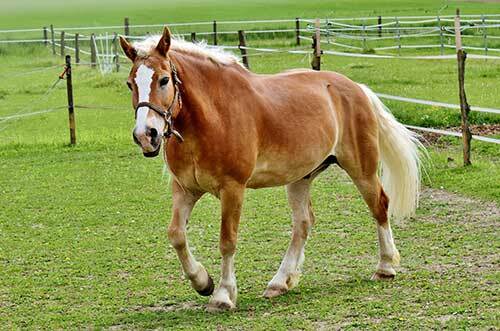 The horse is a gentle four-footed domestic animal. It is found all over the world. It has two bright eyes. It is the most beautiful of all animals. It has a healthy body and a bushy tail. It feeds on green grass and grams. It lives in a shed which we call stable. The horse can run faster than any other animal. It becomes very loyal and obedient to its master when it is trained. It was the only means of travelling in the past. It was also used for carrying letters and goods from one place to another. In this age of wheels, it is rarely utilised in the plains.They are used only in the forests and hilly regions. In the circus, it shows a different kind of feats. Nowadays they are dragging coaches and working in the fields. Some are still used on the battlefields. It is useful both for soldiers and a farmer. In the past, the soldiers were fighting from the back of the horses. It loves its master and sacrifices its life for his sake. No other animal is so faithful and obedient to its master as a horse.Maharana Pratap’s Chetak is an example of it.